Expedition Rated, Whitewater Ready! Stable, Fast & True Tracking! America's Most Popular IKs! Super Sleek & Light - Incredibly Fast! Versatile Catamaran Kayak Does it All! 300x 4.9 out of 5 stars. 385ft 4.7 out of 5 stars. SE330 4.5 out of 5 stars. 393rl 4.7 out of 5 stars. 435ps 4.4 out of 5 stars. 350fx 5.0 out of 5 stars. 385fta 4.9 out of 5 stars. SE370 4.6 out of 5 stars. 473rl 4.8 out of 5 stars. 380x 4.6 out of 5 stars. 465ft 4.9 out of 5 stars. NeedleNose™ Inflatable SUPsSlices Through Water! 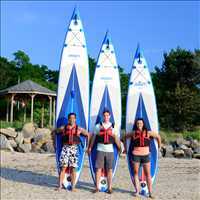 LongBoard Inflatable SUPsUniversal Travel SUP! Our LongBoard iSUPs are now made with 6" thick drop stitch material to increase buoyancy, rigidity, and stability. We've also added 4" nose/entry rocker followed by a slight continuous board rocker and finish/exit with a 2" tail rocker! Hybrid Inflatable SUPTouring and/or Riding The Surf! The Sea Eagle Inflatable Hybrid SUP Series allows you to sit, stand, surf, tour, and even perform yoga on these wonderful SUPs! At 32" wide and 9'6" long it's both the widest and shortest inflatable SUP in our series! Combined with a 4" nose/entry rocker followed by a slight continuous board rocker throughout that finishes/exits with a 2" tail rocker and you have the perfect SUP for both surfing and yoga alike! Our Hybrid SUPs are also made with 6" thick drop stitch material to increase buoyancy, rigidity, and stability. Like our LongBoard series these combined attributes provide over all performance, handling, and stability PLUS INCREASE PIVOT-ABILITY, MANUVERABILITY, and STORABILITY due to their smaller size! 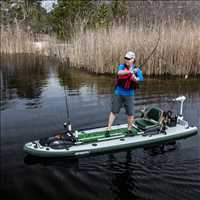 Fishing Inflatable SUPsA Versatile Fishing Platform!